Barcelona manager, Ernesto Valverde has spoken on the reported dressing-room burst-up with his player after they suffered a shock 3-0 defeat to Roma in the Champions League in midweek. Barcelona blew their 4-1 advantage from the first leg to crash out of the competition. There were reports that Lionel Messi and Gerard Pique confronted Valverde over his tactics in the dressing room. 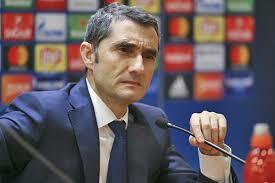 But addressing Spanish media ahead of Barca’s clash with Valencia this weekend, Valverde denied the reports. He said, “I have nothing to say about that [Messi and Pique asking for explanations] mostly because nothing like that happened. ”The team have reacted well since the game. ”We are in a difficult moment, possibly our second worst of the season after August [and the Supercopa de Espana defeats]. ”We lost and we’re out of a competition that we were very excited about and do feel sorry for ourselves and the fans. ”But if we continue to dwell on that game and think about, we will keep losing.”Valverde is keen to use the Champions League disappointment as motivation in their remaining La Liga games. “It will be a function of our staging, we are aware and we know we have to go for the game, we have 10 points left to be champions, it has cost us a lot and we cannot keep whining at home because of what happened,” he added. “To think that if we win tomorrow, we would have seven points to be champions, if they told us a while ago, we would not have believed it, it should not boost what we lost, but what we can win,” he said.